Scan business cards with a mobile app, add lead capture forms to your website, turn emails into new leads, or import new leads with ease. Get a 360 view of a contact’s communications history, key relationships, events and tasks, social profiles, sales opportunities and project involvement. Manage your work outside of sales, such as installations, onboarding, maintenance, event planning and even internal processes, like hiring or website management. Tasks can be used for a variety of duties, like creating To Do lists, logging meetings and phone calls, and setting up email reminders. An integrated calendar displaying all your Insightly events, your tasks with due dates or start dates, and your milestones. Dashboards give you a quick graphical view of the data right up front. Gain a new perspective on your business, and share information with your team. Businesses use Insightly to manage contacts at every stage of the sales process, track customer relationships, monitor their sales pipeline, and more. 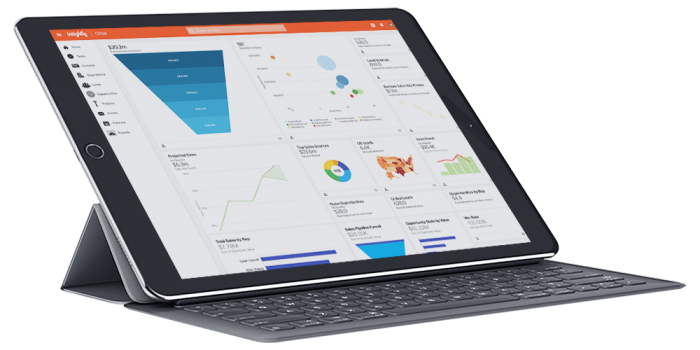 Insightly’s dashboard provides real-time information via a task dashboard and opportunity reports. Insightly also offers integrated project management functionality. Once a deal is closed, users can track and manage follow-up project commitments directly from within the CRM. Insightly can help businesses deal with gobs of incoming emails and contact information while making sure that salespeople stay organized and marketing campaigns remain on track. Discover connections through relationship links. Plan the best sales approach with relationship maps to guide you. Close more deals faster with fewer clicks thanks to sales pipeline management and workflow automation tools. Automate repeat assignments with pipelines. Stay on schedule by managing milestones. Set up workflow automation to ensure on-time delivery. Keep connected to the tools you already use. Never lose a doc with links to your file services. Get relevant data and take action right from your inbox. The CRM For What You Value Most - Life. Time. Customers. Insightly provides customer relationship management software for small and midsize businesses across a range of industries such as manufacturing, consulting, health & wellness, media and others. With more than 1.5 million users worldwide, Insightly is the world’s most popular CRM software. 1. How long does it take to get the Insightly implemented? An Insightly implementation can be done in record speed comparative to other project management systems. An implementation for a client with a dozen employees was done in less than 5 days. With good prior planning, the implementation can be a breeze. 2. Can I bulk import customer data to Insightly? Yes. Insightly’s importing feature lets you import the data on your terms, allowing you to map each column from your file to a field in Insightly. 3. What features are available on mobile app? Insightly’s browser-based application had quite a head-start on our iOS and Android apps, so you won’t find all of the features from the website on your phone or tablet. You can use mobile apps to create, edit, view and search records, add notes, push notifications, view calendar, emails, convert leads to opportunities, record audio notes, access files and more. 4. What kind of reporting can I get in Insightly? 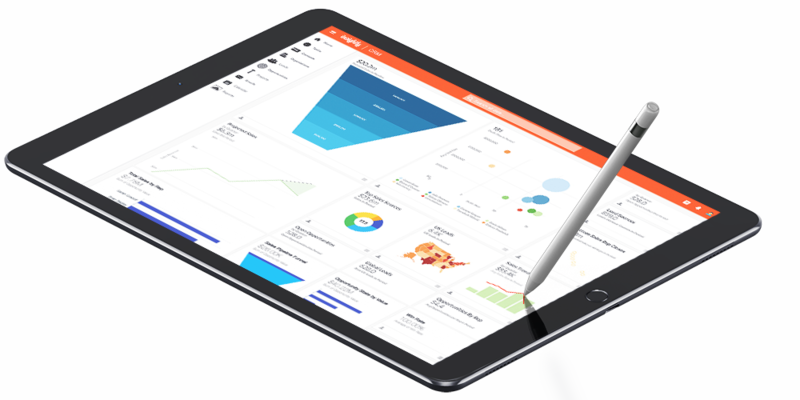 Insightly’s advanced reporting features can provide powerful data for your business. Think about what your dream reports would contain. In order to pull reports on that information, you need to plan to have that information tracked in Insightly. Custom fields and tags can be used to record information you would like to pull reports on. Power BI is a powerful and beautiful visualization tool, and an integration between Power BI and Insightly has made it simple to start using Power BI. 5. How can I get the most of Insightly? To get the most out of Insightly, take the time to plan your strategy. Remember that a CRM is only as good as the system you are asking it to automate. Putting a broken system into a CRM does not fix the system much like putting the best gas into a broken down car doesn’t make the car work. Think about pipelines, teams and reports you’d like to see. 6. What data can I import to Insightly? Determine what data you want in Insightly. Make sure any data you want to import into Insightly is as clean as possible. If you have your data in multiple places – email, spreadsheets, or other programs – make sure to compile the data into one spreadsheet. Once all of your data is in one spreadsheet, you can eliminate duplicates and also determine if there is any information that should not be imported into Insightly. For example, maybe you have leads or contacts that you haven’t touched in a few years, and you’re not even sure if the contact details are current. Or maybe you have contacts with incomplete information. Is it necessary to put these contacts into Insightly? Give as a call if you need immediate help with Insightly.